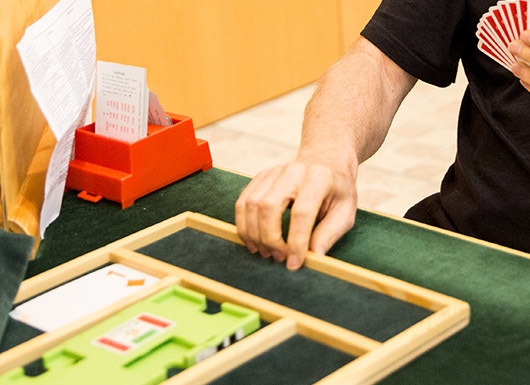 Bridge is not an easy game – it can make the best players appear foolish. With a horrible hand to lead from East went with the 4 (nothing is guaranteed to defeat the contract, although starting with the A and continuing the suit might force declarer to play very well. She wins with dummy’s K and plays a heart but if West takes the ace and plays a third club declarer must ruff with the K. She must then run the Q before exiting with a trump to endplay East. If West does not rise with the A declarer must put up the king in order to get home. In the Roseblum both declarers went down in 4 after the lead of the A). Declarer put in dummy’s ten and when it held she continued with a diamond to the ace and ruffed a diamond with dummy’s 3. West overruffed and after considerable thought cashed the A before switching to a club, East winning and returning a club. Declare won with dummy’s king, cashed the A and then tried to get to hand by ruffing a club, East’s overruff representing the setting trick. Declarer’s first mistake was not to ruff the third diamond with the 9. If she does that, then she will still need to take the right view in clubs, but at least she will not give the defenders a sure route to success. Having overruffed, West needs to find a club switch. East wins and returns a club and declarer wins with dummy’s king and plays a heart. West wins with the ace and now a third club promotes East’s Q. Having survived that, declarer only needed to return to hand with a spade ruff in order to draw the outstanding trump. 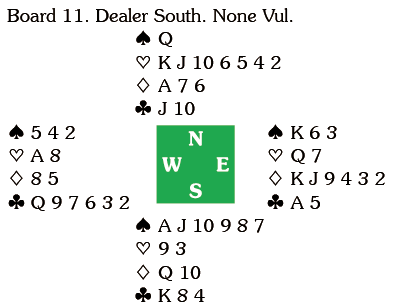 One more thing before we move to the other table – suppose East drops the K under the ace? Then declarer might easily go wrong. Here too East led a diamond and declarer won with dummy’s queen and ran the 9. East won and now does best to return a heart, holding declarer to nine tricks, but she switch to the ace of clubs and a club and declarer could ruff her losing diamond for a tenth trick.